On Sunday our senior's McArdle Cup game against St Anthony's was postponed due to a waterlogged pitches. 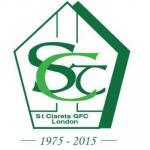 This weekend we face newly formed Wandsworth Gaels in the McArdle Cup. Training continues on Tuesday and Thursday at Hillingdon Athletics Stadium, Gatting Way, Uxbridge, UB8 1ES. Be ready for 7.45pm. Youth training commences this week at Hayes Rugby Club, Kingshill Avenue, Hayes, UB4 8BZ. This year we are delighted to say that we will be fielding teams at every age group. All youth teams from Under 6s upwards will train on Wednesdays with the exception of our U15 and U17 boys who will train on Thursdays. All newcomers, boys and girls, are welcome so bring your kids down to try out Gaelic football if they haven't done so before. Our Annual Golf Day is now less than two months away (Friday 8th June). Please contact us to submit your interest and receive the Entry/Sponsorship forms for the day. Please also let anyone else know about this who may be interested. Our Golf Day is a vital fundraiser each year and it's important to make it as successful as possible to sustain the club and aid all of our teams all the way down from Under 6s up to our men's team.